Execution Rocks Light is a lighthouse in the middle of Long Island Sound on the border between New Rochelle and Sands Point, New York. It stands 55 feet (17 m) tall, with a white light flashing every 10 seconds. The granite tower is painted white with a brown band around the middle. It has an attached stone keeper's house which has not been inhabited since the light was automated in 1979. This island on which this lighthouse sits got its name from colonial New York, when prisoners were chained to the rocks during low tide. On March 3, 1847, the United States Congress appropriated $25,000 for creation of Execution Rocks Lighthouse. Designed by Alexander Parris, construction was completed in 1849, although it was not lit until 1850. Over the years, it has survived both a fire and a shipwreck. The island is under the authority of the United States Coast Guard and is off limits to the public. It can be seen, however, during the Long Island Lighthouse Society's Spring Cold Coast Cruise, and from the Throgs Neck Bridge. A Daboll trumpet was added to Execution Rocks Light on Jan 25, 1869. Before being executed for murder, serial Killer Carl Panzram claimed in a posthumous autobiography that in the summer of 1920 that he raped and killed a total of ten sailors and dumped their bodies at sea near Execution Rocks Light. Designed and built (1848–49) by Alexander Parris. Six story 72 ft. tower has frustum shape. Cut granite masonry keeper's dwelling (1867–68) in Gothic Revival style with 2.5 floors, approx. 1000 SF. Early example of "wave swept tower" engineering. On protective rip-rap artificial island (approx. 0.3 acre) with small boat basin. Listed on the National Register of Historic Places and designated Historic Civil Engineering Landmark by American Society of Engineers. Property must be maintained according to the Secretary of Interior's Standards for Rehabilitation. Historic covenants will be incorporated into the Quitclaim Deed; however, no submerged land will be conveyed under the Quitclaim Deed. The U.S. Coast Guard shall retain an easement for an Arc of Visibility and an unrestricted right of access in, to and across the Property to maintain, operate, service, repair and install equipment as necessary to support its aid to navigation mission. Additionally, the U.S. Coast Guard shall retain the unrestricted right to relocate or add any aids to navigation, or communications towers and equipment (along with necessary right of ingress/egress), or make any changes on any portion of the property as may be necessary for navigation/public safety purposes. It was added to the National Register of Historic Places in 2007 as Execution Rocks Light Station. On January 27, 2009, the Secretary of the Interior announced that Execution Rocks Light would be transferred to the Philadelphia-based Historically Significant Structures, which would partner with the Science Museum of Long Island to restore the light. The lighthouse was featured on the Travel Channel show Ghost Adventures in 2009. 1847, March: Congress appropriated $25,000 for the light to be built. 1849, May: Construction was completed. 1850: The lighthouse was first lit. 1856: A fourth order Fresnel lens was installed. 1868: The keeper's quarters were added. The keeper no longer had to live in the cramped space inside the tower. December 8, 1918: A fire with an unknown origin caused $13,500 in damages. The engine house and machinery were destroyed, the tower and oil house were damaged and the windows, woodwork, gutters and eaves were also damaged. December 5, 1979: The lighthouse was automated. A VEGA lantern replaced the Fresnel lens. 2010: Historically Significant Structures Inc. is giving tower climb tours of the lighthouse in the summer. ^ Light List, Volume I, Atlantic Coast, St. Croix River, Maine to Shrewsbury River, New Jersey (PDF). Light List. United States Coast Guard. 2009. p. 192. ^ a b "Historic Light Station Information and Photography: New York". United States Coast Guard Historian's Office. Retrieved January 31, 2009. ^ Rowlett, Russ (2010-03-25). 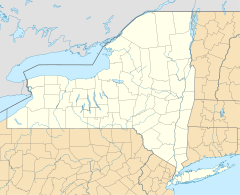 "Lighthouses of the United States: Downstate New York". The Lighthouse Directory. University of North Carolina at Chapel Hill. ^ Available properties through the National Historic Lighthouse Preservation Program for 2008. ^ Newsday, January 27, 2009, "Philly group gets care of Execution Rocks Lighthouse"
Wikimedia Commons has media related to Execution Rocks Lighthouse. "Execution Rocks Light". Inventory of Historic Light Stations, New York Lighthouses. National Park Service. Retrieved 25 March 2010. "A non profit for the restoration of Execution Rocks Lighthouse". Historically Significant Structures Incorporated. Retrieved 25 March 2010.